eScrip and Ralphs Community Contribution are NO COST ways for you to donate to Reading to Kids when you shop at these grocery and other stores. PLEASE NOTE: You must register annually! AmazonSmile is another FREE way you can support us with your Amazon purchases! • On the registration page enter Reading to Kids as the name of the group you wish to support (ID# 3821833). • Follow the rest of the instructions to register your grocery club card and/or credit cards with eScrip. Here's a list of their participating retailers. • By phone: Call Ralphs Community Contribution Program at (800) 443-4438. Explain you want to register your Ralphs card number and your telephone number. Reading to Kids' new NPO# is BR278 (as of 8/17/18). • At that screen, click on "Enroll" under Participant. • Follow the rest of the instructions to register your grocery club card with Ralphs Community Contribution. • You should see a pop-up window that asks if you want to change your charity to READING TO KIDS. Click the Yes button. • From then on, access Amazon by entering smile.amazon.com in your web browser and logging in to your Amazon account. 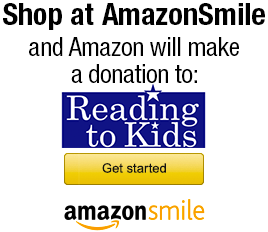 Amazon will donate 0.5% of your purchases to Reading to Kids!